... is quick and easy to produce. 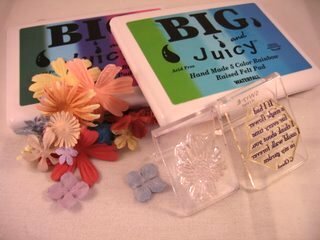 Time is short and someone has just asked you to make a card for them right NOW, and all you have to hand is some ink, one flower stamp, a verse and some odds and ends in your "Stash"
Well the easiest thing to do is to take some of your plain white cardstock and simply fold it in half. Then with the ink pad, stamp the flower design all over the front in a random way. Allow some of the stamp to overhang the edge of the card. I have used the "Big and Juicy" water based ink pads as they give you several different colours on the one pad. Excellent value ... and moving the stamp around the pad will alter the colour. This ink pad is called "Hydrangea"
Do Not store these ink pads upside down or at an angle. This ink pad is called "Waterfall" was used to produce this card and the colour scheme makes it look different. And again with a small brush, and a tiny amount of water I have brushed in the ink from the edges of each flower to the centre. 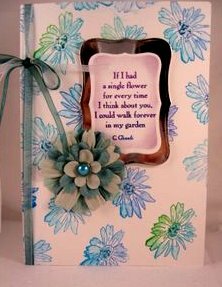 The sentiment was stamped from the same pad and Matted and Layered onto silver Mirror Card. Then raid your stash and see what you have to adorn the card. 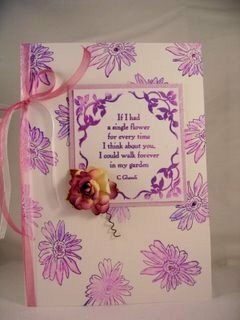 Any Embellishments can be added to put your individual touch to each card.